While in Italy, Ducky had a fountain made in his likeness. He wore a toga and a crown of olive leaves just like Caeser. When modelling for it, he thought it was weird that Gatocelli didn’t look at him much and that he wasn’t allowed to look at the statue until it was finished. Towards the end of sculpting, Ducky got tired, took off his costume, and went to get a snack. When he came back the statue was gone. “Where is the statue?” Ducky asked. “I put it on top of a fountain and it’s now in the garden”, replied Gatocelli. Ducky was so excited … until he reached the garden. 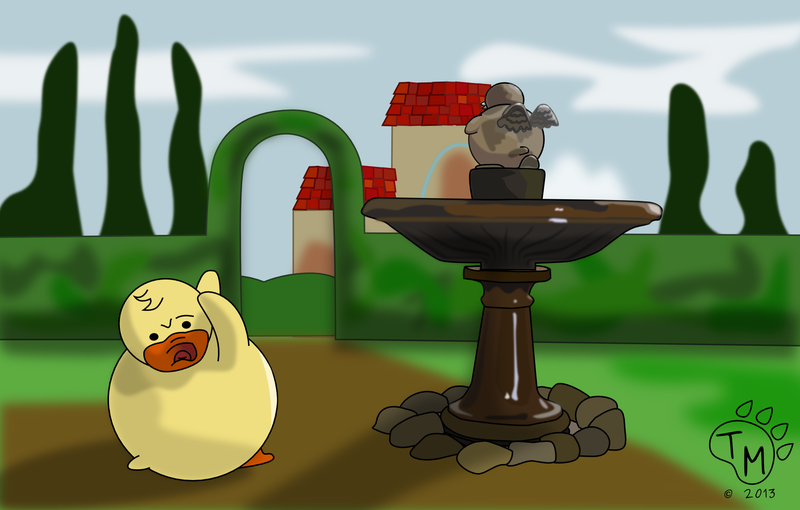 Once he saw the fountain, his eyes almost bulged out of his head and he sank back in embarrassment! The statue was not of him as a Caeser but as a chubby cherub- PEEING! So embarrassing! This is the last time he will trust Christmas Koala to recommend an artist! « Ducky Adventures Turns One Years Old!